So a friend of ours in the neighborhood had a housewarming/bbq rooftop party this weekend and basically had a ton of leftover food. 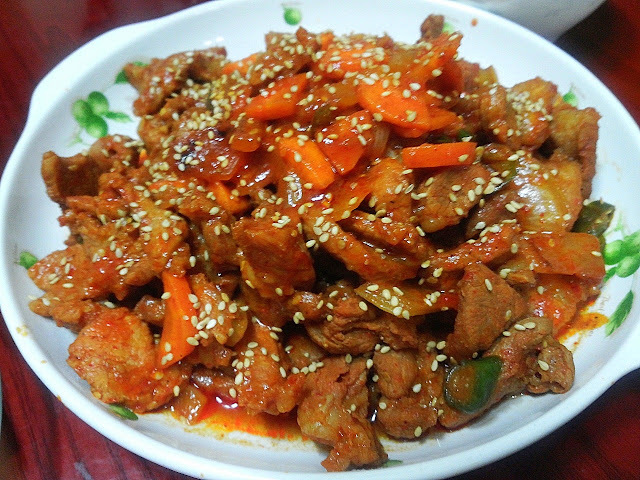 Moksal over grilled charcoal outdoors is fantasssssssssssssssstic (I prefer it over samgyubsal too... unless it's from Tamradon of course) but moksal can also be used to make a popular spicy, stir fry dish called Jeh Yook Bokkeum which is what I decided to make with. This is a very standard pork dish that's popular and commonly eaten by Koreans not just at home but as a lunch meal for workers and students at lunch joints. It's a little spicy, a little sweet and flexible enough to adjust the seasoning to your taste. It's a great way to sneak in veggies for picky kids too so give it a go! 1. First chop your onions, slice your carrots into half moon slices, hot peppers (if you're using them) and green onion into slices and set aside in a large bowl (except for the sliced green onions). Do this first to avoid cross contamination when handling your pork later or use a separate cutting board and knife. 2. Lay your pork shoulders out on a board and take your knife and begin lightly whacking into the meat. You don't want to cut through the meat but leave "indents". This will help the pork tenderize and also to absorb the sauce better later. Do this on both sides until you have a rough criss-cross pattern. The reason for this step is to eliminate any strong pork smell and will help eliminate any "game-y" smell. 4. After 30 minutes, take the pork out and begin cutting the pork into thin cuts (roughly 1-2 inch bite sized pieces) and cutting out any big fat chunks along the way. Dump the pork cuts into the same bowl as the veggies you chopped up before. 5. To your bowl of veggies and pork, add all the ingredients for the sauce. Get a plastic disposable glove on and toss and mix until everything is coated. 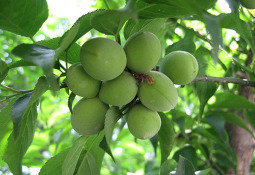 Also, plum liquid is referred to as maeshil won eck (매실원액) in Korean. 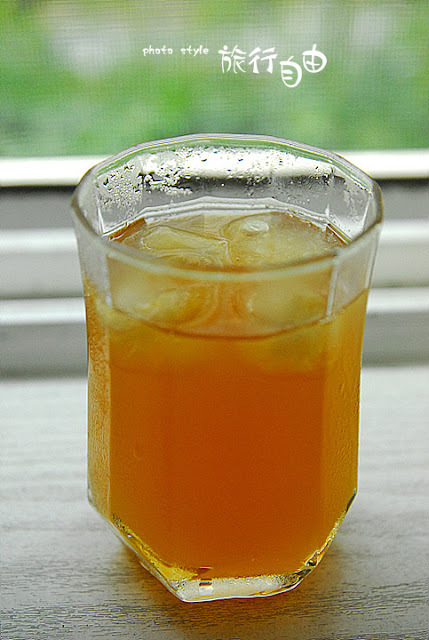 This is a sweet, slightly tart liquid made from the fruit of Maesil, also known as Japanese Apricot. This deep-flavored concentrate liquid is less commonly known as an ingredient for cooking but a secret for many Korean cooks! It deepens flavor, adds sweet tastes in a healthier manner and helps give a more clean-cut taste in dishes. You can also mix the concentrate straight with cold water to create a refreshing tea that helps with indigestion and I've even seen it used in cocktails. 6. Take the bowl of seasoned pork and veggies, cover with wrap and place in a fridge for a minimum of 3 hours to allow everything to marinate. 7. To get cooking, heat up a nonstick pan with a little coating of oil. I like to begin at high heat just to get a crispy exterior and then turn it down to medium heat to finish the cooking process. I will say, the most ideal is to grill it over a charcoal fire to get that charred exterior.. mmm mm... although in that case I would recommend not cutting the pork up and just marinating and cooking the pork in full. Cooking will take approximately 7-10 minutes. Because of the red sauce, it may be difficult to see if the insides are fully cooked so check if it's done by grabbing a piece of meat and cutting into it with a pair of scissor. You'll be able to see if the inside is fully cooked. Add the chopped green onions at the last minute or two of cooking. Serve hot and with plenty of lettuce and perilla leaf wraps! 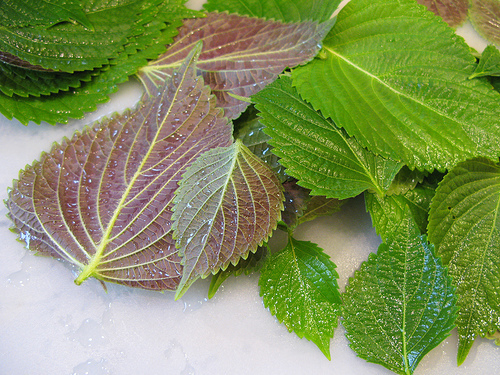 Perilla leaves are commonly found in Asian markets and are a favorite of Koreans in wraps. It has an interesting kick to it which can be off putting to some. But it pairs really well with pork in general. You can even take a few perilla leaves when cooking jehyook bokkeum and use scissors to cut strips of it into the dish to add a little minty kick to the dish. Try some out for your next barbecue! Great post! Finally, I found the Recipes For Stir Fry that I'm looking for a long time. I will show this to my husband and I'm sure he will be glad when he see this one. Thank you for sharing this with us.